The Best Craft Youtube Channels from thousands of top Craft Youtube Channels in our index using search and social metrics. Data will be refreshed once a week. 1.19 Paper Folds - Origami & Crafts! About Youtuber Simple Kids Crafts is a video blog dedicated to making easy, educational recycled crafts for people of all ages. Here we share Dollhouse and Miniature Crafts, General DIY and Doll Crafts. Our blog features crafts made out of recycled and Eco-friendly materials, as well as paper, cardboard, fabric etc. Follow this channel to get videos dedicated to making easy, educational recycled crafts for people of all ages. About Youtuber DIY crafts channel: Here you will find very easy diy and crafts. Follow this channel to get easy diy craft tutorials. About Youtuber My name is Isa. There are original ideas doing arts and crafts with recycled products ... but all in an easy and fun way. Follow my channel and find tutorials, tips and tricks of makeup , hair, beauty , personal care and much more. About Youtuber Origami tutorials by Jo Nakashima. Follow this channel and learn how to make awesome origami models, from simple to complex! About Youtuber Video tutorials of handcrafted projects from paper flowers, to sewing projects to making your own rugs, pillows and home decor. Follow this channel and get DIY decorating ideas, paper flower patterns, or gift wrap tips and much more. About Youtuber Welcome to your favorite craft channel with highest creativity. You can find all kind of DIY and tutorials step by step of your hobby. Things like fofuchas, Hand Crafts, Decoupage, Patchwork, Card Making, Recycling, Home Deco, Gifts, Celebrations. Do it Yourself! Follow this channel to get step-by-step tutorials on craft work. About Youtuber Hi, My name is Giulia Talmacel. Hrer you will DIY Crafts Tutorials , Crafting Tools Reviews and Vlogs. Follow this channel and learn Amazing Crafts - Paper Crafts, Valentine Crafts, Easter Crafts, Origami, Quilling, Crafts for Kids, Craft Projects, Home Decor Crafts, Paper Flowers, Christmas Crafts, New Year Cards, Valentine's Day Cards, Scrapbooks, Greeting Cards, Mother's Day Cards, Father's Day Cards, Pop-up Cards, Exploding boxes, Handmade Photo Albums, Gift Boxes and Packing, etc. About Youtuber My name's Abi and I am a big fan of sweets deco and miniatures. It is my dream to one day make perfect 1/12 scale miniatures. I like to work with clay, resin, paper, wood, and many other mediums. This channel is a mix of everything I like. I hope you'll find something you like! Follow my channel and get videos about Japanese toys, food, and crafts. I also talk about Tokyo Disney Resort a lot. About Youtuber One of the largest art and craft companies, we love DIY projects and making alongside art and craft enthusiasts. Follow this channel and find videos on creative ideas, tips, patterns, & events here! About Youtuber Welcome to the FaveCrafts channel where we have 1000's of free craft projects, home decor ideas and DIY tips. We are alway adding new projects and tips. Some of our favorites include Christmas Crafts, Free Knitting Patterns, Free Crochet Patterns and Crafting with Kids. Follow this channel and find step-by-step instructions, videos and patterns to make it quick and easy. About Youtuber The Craftsy YouTube channel, where we share inspiring ideas and a-ha tricks from industry pros and everyday makers like you. No matter your passion, we’re your destination to learn something new, master a trendy design or just become more confident in your skills. Follow this channel to get craft videos for more inspiration from tips & tricks to the squishiest yarns and most playful fabrics. About Youtuber Welcome to my channel! I create beautiful embroidery designs & tutorials. I make embroidery fun and easy through my videos! Hope you all like! Follow my channel as I share embroidery designs & tutorials! About Youtuber This channel is all about DIY, lifehack, tutorials, nail art and other awesome ideas that pop on my mind.We always strive to upload the best quality content on our channel. The best part of our channel is that we transform the old and useless waste materials into a new creative and daily need usefull material and we upload a new video everyday. Follow this channel and get DIY tutorial that are very easy and simple to follow. About Youtuber Raghuvaran uploads attractive quilling designs on his youtube channel. Subscribe to this channel for learning technics of quilling and quilling art. Follow this channel to get more videos on paper quilling and art. About Youtuber Learn & shop with Create and Craft, the UK's number one live TV Craft channel. Tune in for live demonstrations plus tips and techniques from the experts! About Youtuber DIY handmade, home decor, room decor videos. About Youtuber I create tutorials for Paper crafting. 19. Paper Folds - Origami & Crafts! About Youtuber Origami & Paper craft demos made very easy to learn! About Youtuber Want to learn hand embroidery? Who has the time? You do. I know, I know, it sounds painstaking, time-consuming and intimidating. You can learn to embroidery. I say so. This is a deceptively simple craft. Embroidery is easy, relaxing, and one of the least expensive hobbies you can take up. YOU CAN DO THIS. About Youtuber Where craft unfolds... This is one of the most popular Youtube channel on Card Making. Follow this channel to find step by step video tutorials on cardmaking. About Youtuber Arte y Salud en Casa means art and health from home. Here, you will find easy DIY´s, crafts using easy to find supplies and much more. About Youtuber Blogger, crafter and all around paper addict!! I love crafting and making tutorials for you!! On my channel I try to post easy to make crafts that anyone can do. I dabble in all crafts, paper, paint, and much, much more. About Youtuber Hi, I am Minakshi Biswas. I am a housewife from India. I make DIY videos in my spare time. Hope you like them. About Youtuber This channel is an Innovative way to share our own creativity and happiness with others. About Youtuber Only FRESH OWN DIY Crafts: Room decor, Desk organization, Gifts Tutorials, DIY Bags & Backpacks, Home DIY Crafts, Clothes Recycle Tutorials, School DIYs and other. New video every 5 days. Here you will find really interesting and usefull DIY Ideas. About Youtuber Hi everyone! Welcome to my small craft corner where I show you some of my favorite crafts. Right now I am focused on making paper flowers and tutorials. I upload twice a week (Tuesdays and Thursdays) and sometimes I do bonus videos on Saturday. About Youtuber Recycled Bottles Crafts is a part of big diy crafts project. Here you'll find wonderful diy crafts ideas which you can make out of plastic bottles, cups, containers and so on. Use these ideas for your school projects, for home or garden decoration, for fun and soul. About Youtuber DIY-Paper Crafts is channel that show you how make some art and crafts from crepe paper, tissue paper and origami paper. About Youtuber Find DIY, how to make greeting cards, card making ideas, tutorials, paper crafts, origami, paper folding, handmade, scrapbook, crafts ideas, arts, gift ideas all this and more on the channel Idea Of The Day. About Youtuber Independent Stampin' Up! demonstrator, bespoke gift packaging and box designer. About Youtuber Hello there! 🙂 Crafting is my greatest passion of all. I will be sharing a kinds of craft tutorial here in my channel. About Youtuber Hello everyone, my name is Ishan and this channel is about cardboard crafts, home decoration, toys and other things which you can make or do at your home. About Youtuber Welcome to my channel "Mitanjali.M". This channel I, have created to share my knowledge in crafts, especially News Paper Craft. I remember, when first time in YouTube, I saw this wonderful craft and very creative, rolling, coloring and weaving ideas, I was very much impressed. About Youtuber Since 1988, Stampin' Up! has been helping people discover and share their creativity through our exclusive line of decorative stamp sets and accessories for cards, scrapbooking, craft projects, and home décor! About Youtuber Hey, y'all! Welcome to my brand new channel, where you'll find loads of recipes, DIYs, and craft tutorials. About Youtuber Craft Videos channel is dedicated to make easy crafts and easy cards for kids. Here in this channel we are making videos on handmade cards, handmade crafts and best out of waste as well. About Youtuber Origami / Paper Folding | Kirigami / Paper Cutting | Paper Craft - Ideas / Tutorials / How To's / DIY (Do It Yourself) Videos. About Youtuber I am Saranya Kuppusamy, homemaker of a beautiful family. Whatever crafts I try to make, I realize one thing each time, "In Crafting, there are no mistakes, it is your own unique creation". About Youtuber Welcome to our channel! Here you'll find lots of craft supplies and inspiration. About Youtuber Our quilting tutorials and bag tutorials are designed to show you easy ways to make quilts and bags. So who are we?...well Alanda Craft is Paula and Wanda and we have a passion for all things craft related and in particular we love making bags, quilts, scarves, working with mixed media to create works of art and machine embroidery. About Youtuber Paper crafts is the collection of art by innovative use of paper to form amazing three dimensional structures. . Paper crafts provide tutorials on various techniques of paper folding which consists of Quilling, Origami and Kirigami. About Youtuber Hello and welcome to my channel! Here you will find many projects that reflect my love of crafting and unique way of thinking outside the box. I hope to inspire you with my tutorials and not only enable you with my hauls but encourage you to use what you have and turn the ordinary into something extraordinary! About Youtuber We love doing Crafts, Drawing, Painting and sharing it with others! About Youtuber Happiness crafts and Latino DIY by Kathy Cano-Murillo, The Crafty Chica. Here you'll find all things shiny, happy, and easy-to-make. About Youtuber Hi there! Thanks so much for visiting! It's wonderful to see you! 🙂 Find tutorials on paper crafts. About Youtuber Welcome to my Channel. Here you can see my passion on Arts and Crafts. About Youtuber Knitting, Stitching and fashion designing.......This page is all about how one can be creative at home and also can enhance his/her skills in embroidery and other work by watching the videos. About Youtuber Here you will find a number of videos, including handy hints, product and project tutorials, product trailers, company information and much, much more. About Youtuber Hello and Welcome everyone! Thanks for stopping by my channel. My name is Shemi Dixon. I am a mixed media artist, Creative coach and Content Creator. Recycled Art, Abstract Painting, Art Journaling , Mixed media projects, Decoupage projects and crafts! I want to inspire you to life a Creative Life. Join Me! About Youtuber My Craft is a craft youtube video channel that uploads craft videos. About Youtuber I'm an avid craft blogger and love to break things down into logical teachable bites. Come along with me on my crafting journey, where I take complicated things and make them seem easy. About Youtuber Hi! I’m Galina. Welcome to my crafts tutorial chanel. You can learn how to make many different Paper Crafts, origami models, boxes, flowers, paper balls, kusudama, hearts, Party decoration ideas, Christmas toys and decoration, Easter Crafts, Valentine's Day Crafts, Paper Flower Bouquet. About Youtuber DIY Crafts by Isabel! Welcome everyone, I love to make and create fun, creative and cool DIY Craft projects. I have a craft project for everyone whether you are looking for a kids craft, teen craft or a DIY craft for your home. I have plenty of how-to and DIY tutorials. I love to make DIYs that everyone can enjoy. I hope you enjoy watching! About Youtuber K4craft follows a holistic approach to nurture talent and teach everything related to crafts including simple decorations, jewellery, knitting, embroidery, paper crafts, quelling, ceramics in addition to fundamental tutorials for beginners. About Youtuber We believe that nothing is as unique, personal or well-received as something that's been lovingly handmade. That's why we aim to make Hobbycraft the place for you to feel inspired and excited about craft. So, whether you're new to crafting and want some advice, or an expert seeking new skills, we'll help you with everything you need to watch, make and learn! About Youtuber LindaBauwin is an Independent Demonstrator for Stampin' Up! helping you create from the heart. The mission is to help you find your creative side. About Youtuber I am an UK Independent Stampin Up demonstrator. I Upload 3 Tutorials a week, Wednesday, Friday & Sunday. I will be sharing with you my love of stamping and creating! I love making 3D craft projects like Gift boxes and unusual bags etc. I also want to share the beautiful products that Stampin Up carry and the ease of which they go together. About Youtuber aber-Castell is one of the world's leading manufacturers of fine artist materials. Faber-Castell's Design Memory Craft products are designed around a MIX & MATCH concept. About Youtuber We are all about fun and easy to do crafts for kids and kids at heart! We love all things crafty and arty and are sharing tutorials and ideas for origami (perfect for kids and beginners), paper crafts, paper toys and more. About Youtuber Crafts, Tutorials, Do-It-Yourself Projects, Recipes, Photography, Fashion, and more! Tutorial videos to show you how you can accomplish a project. Enjoy!! About Youtuber We will show you, how you can decorate your home with the waste thing such as Newspaper, plastic bottle, CD, Toilet tissue paper roll, spoon etc. About Youtuber Hello.This is my channel of craft. In here you can find recycling ideas, how to make beautiful things from extra or waste stuff. It is really fun when you turn extra stuff into something incredible. About Youtuber I share Pocket Letter tutorials, ideas, DIYs as well as other papercrafts. I love planners, snailmail, scrapbooking, and blogging. About Youtuber Helen Griffin is a Paper Arts Educator & Designer based in the south east of England. She is also a member of Papercraft Magazines Design Team & The Pootles Design Team. About Youtuber From my art journal to scrapbook layouts, mixed media cards and canvases to DIY party decorations I love to make stuff. I am a full time crafty instructor and blogger, and I'm excited to share ideas and videos with you here on YouTube. About Youtuber The aim is to make paper crafting enjoyable and easy through teaching through digital training videos, sharing great Stampin' Up! card ideas, providing stamping techniques, tips and/or tutorials. About Youtuber This channel is all about stamping up card ideas, stamping techniques, and quick and easy hand made card ideas. About Youtuber Factory Direct Craft uploads videos on diy crafts tutorials. About Youtuber Find Card Making and Paper Craft tutorials. About Youtuber Papercraft inspirations - your favourite card making and papercraft magazine! Never be stuck for inspiration again with the UK's favourite card making magazine. Each issue of PaperCraft inspirations is crammed with inspirational card making and papercraft ideas and tonnes of techniques for you to try. About Youtuber Hey guys welcome to my channel!!! My name is Lilly.... I created this channel so that i can share the love and passion i have found for paper crafting.. This channel will be filled with a variety of things, from hauls, to craft with me videos, project shares, shop with me videos and even future giveaways..
About Youtuber Hi Friends! Welcome to My channel! I hope we can share, and learn and grow together. I love all things crafty, and love to try new techniques. I have lots of different kinds of videos for you to check out and I love to alter vintage and found objects. If you have any questions dont hesitate to drop me a line, I love to make new friends! About Youtuber Paper Source is a specialty retailer offering a unique selection of fine and artisanal papers, invitations and announcements, personalized and distinctive gifts, gift wrap, greeting cards, custom stamps, and an exclusive collection of envelopes and cards. We want to inspire people to do something creative every day. About Youtuber We specialize in hand made crafts and event planning. Please visit my store if you want to buy the butterflies, flowers, digital files, or other products featured in my videos. About Youtuber Demo's and 'how to' about realistic drawing, painting. About Youtuber Hello everyone!! Welcome to my channel!! In this channel, you will find easy DIY ideas and crafts. Hope my videos will inspire you to create something beautiful with your own hands. About Youtuber Welcome to American Crafts. We're the source for bright, bold colorful paper with clean, modern designs. #craft #paper #scrapbooking. American Crafts designs and manufactures some of the most innovative and fashionable scrapbooking products available. About Youtuber Robin Feicht has been teaching creative Paper Crafts, Card Making, DIY Home Decor and Scrapbooking since 2005. Follow the channel to find crafting videos and tutorials to inspire your creativity. About Youtuber DIY Craft Ideas: Do-it-yourself projects and craft ideas that are easy to pull off. Fun crafts, experience the joy of doing it yourself! About Youtuber Hey y'all my name is Liz and this is where I post about all my craft related activities. I do hauls, swaps, DIYs, tutorials, vlogs and much more. About Youtuber Crafters Corner was originally started by Shalini Mittal in 2008 for creating and teaching handmade products through papercrafts like paper quilling, punchcraft, parchment, cardmaking, scrapbooking etc. About Youtuber Hey I'm Sam, a Wife, Crafter, Blogger and Youtuber. Sharing my love of all things crafty for you all to see. About Youtuber We are a kids craft channel that will inspire your kids to create and enhance their crafting skills. Watch videos on Youtube. About Youtuber We make high-quality inks, mixed media & artists tools. Tsukineko. Paper Crafts. Cardmaking. Scrapbook. DIY. Get your craft on with Imagine's crafting projects and tutorials. About Youtuber Established in 2011, www.DIYInspired.com is a creative resource containing tips and ideas for parties, home decorating, repurposing, including step-by-step photo tutorials for craft and do-it-yourself projects. There are over 1K free step by step tutorials available. About Youtuber Handmade is what i make with love . About Youtuber The Crafts Council's goal is to make the UK the best place to make, see, collect and learn about contemporary craft. About Youtuber Hello everyone! Welcome to my channel! Kraft Time is a channel for easy crafting ideas i.e. Newspaper craft, Home Decoration, Best out of Waste etc. You can find here step by step tutorial for all type of D.I.Y. projects. About Youtuber Welcome to ByHand! On my channel, you will watch DIY videos, arts and play together to bring fun, joy and happiness whatever your age. You can follow along with us and learn how to draw, paint, fold, and all kinds of cool things! About Youtuber Hello friends! This is a guide channel for making flowers from paper and handmade products. Hope that after you watch these videos will have more ideas to create beautiful products made by yourself! About Youtuber Hi, I'm Natalie! I'm a craft and DIY blogger at Doodlecraftblog.com My wonderful husband let's me be a play-at-home mom! My 3 kids are my partners in crime. We love Sci-fi and geeky crafts, kid project, parties, decorations, holidays (mostly Halloween--we love costumes), furniture building, upcycling, roadside rescue and redo's...and much more 5 times a week! About Youtuber Art & craft Channel focusing on paper quilling and filigree with free explanations and steps in the hopes of spreading the beauty and artistic value of paper craft to the world. About Youtuber Crafts and Kitchen. 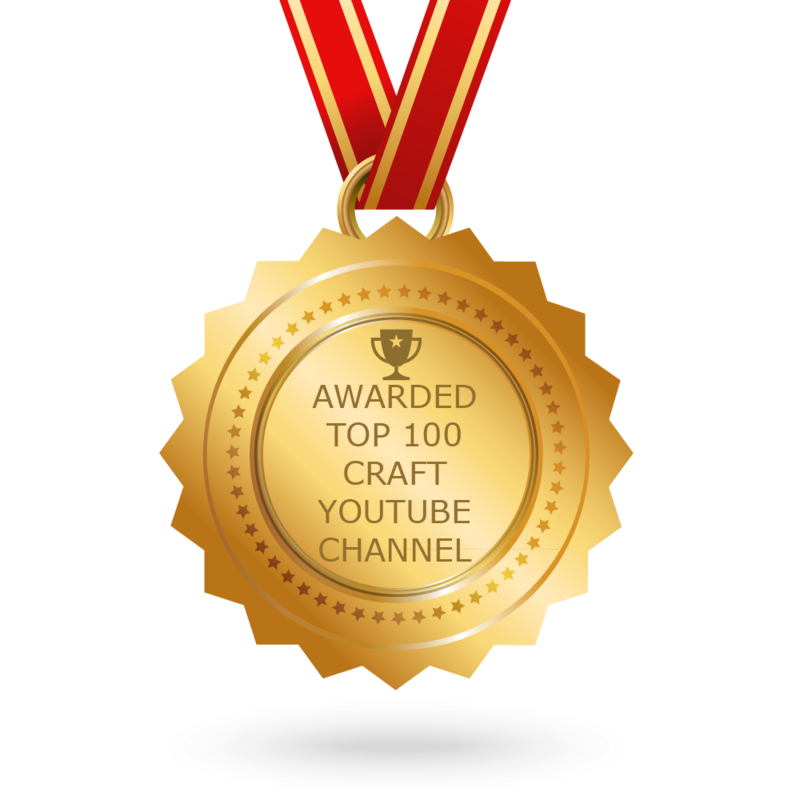 CONGRATULATIONS to every youtuber that has made this Top Craft Youtube Channels list! This is the most comprehensive list of best Craft Youtube Channels on the internet and I’m honoured to have you as part of this! I personally give you a high-five and want to thank you for your contribution to this world.